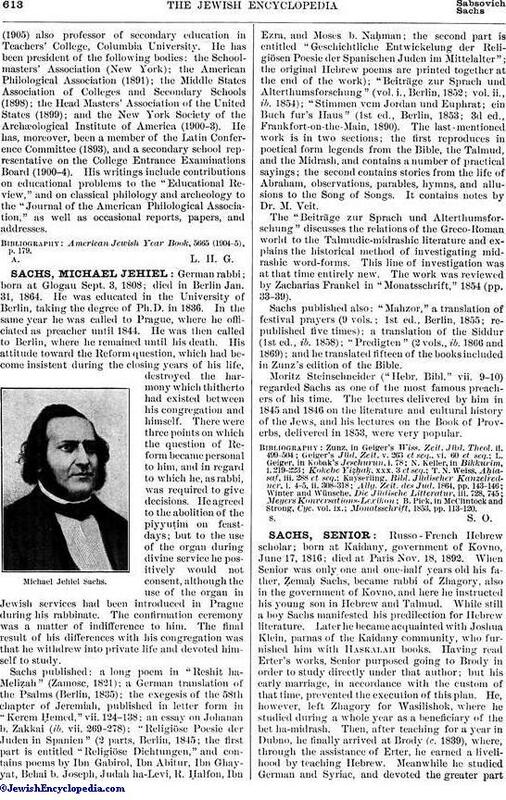 German rabbi; born at Glogau Sept. 3, 1808; died in Berlin Jan. 31, 1864. He was educated in the University of Berlin, taking the degree of Ph.D. in 1836. In the same year he was called to Prague, where he officiated as preacher until 1844. He was then called to Berlin, where he remained until his death. His attitude toward the Reform question, which had become insistent during the closing years of his life, destroyed the harmony which thitherto had existed between his congregation and himself. There were three points on which the question of Reform became personal to him, and in regard to which he, as rabbi, was required to give decisions. He agreed to the abolition of the piyyuṭim on feast-days; but to the use of the organ during divine service he positively would not consent, although the use of the organ in Jewish services had been introduced in Prague during his rabbinate. The confirmation ceremony was a matter of indifference to him. The final result of his differences with his congregation was that he withdrew into private life and devoted himself to study. Sachs published: a long poem in "Reshit ha-Meliẓah" (Zamosc, 1821); a German translation of the Psalms (Berlin, 1835); the exegesis of the 58th chapter of Jeremiah, published in letter form in "Kerem Ḥemed," vii. 124-138; an essay on Johanan b. Zakkai (ib. vii. 269-278); "Religiöse Poesie der Juden in Spanien" (2 parts, Berlin, 1845; the first part is entitled "Religiöse Dichtungen," and contains poems by Ibn Gabirol, Ibn Abitur, Ibn Ghayyat, Behai b. Joseph, Judah ha-Levi, R. Ḥalfon, Ibn Ezra, and Moses b. Naḥman; the second part is entitled "Geschichtliche Entwickelung der Religiösen Poesie der Spanischen Juden im Mittelalter"; the original Hebrew poems are printed together at the end of the work); "Beiträge zur Sprach und Alterthumsforschung" (vol. i., Berlin, 1852; vol. ii., ib. 1854); "Stimmen vom Jordan und Euphrat; ein Buch fur's Haus" (1st ed., Berlin, 1853; 3d ed., Frankfort-on-the-Main, 1890). The last-mentioned work is in two sections; the first reproduces in poetical form legends from the Bible, the Talmud, and the Midrash, and contains a number of practical sayings; the second contains stories from the life of Abraham, observations, parables, hymns, and allusions to the Song of Songs. It contains notes by Dr. M. Veit. The "Beiträge zur Sprach und Alterthumsforschung" discusses the relations of the Greco-Roman world to the Talmudic-midrashic literature and explains the historical method of investigating midrashic word-forms. This line of investigation was at that time entirely new. The work was reviewed by Zacharias Frankel in "Monatsschrift," 1854 (pp. 33-39). Sachs published also: "Mahzor," a translation of festival prayers (9 vols. ; 1st ed., Berlin, 1855; republished five times); a translation of the Siddur (1st ed., ib. 1858); "Predigten" (2 vols., ib. 1866 and 1869); and he translated fifteen of the books included in Zunz's edition of the Bible. Moritz Steinschneider ("Hebr. Bibl." vii. 9-10) regarded Sachs as one of the most famous preachers of his time. The lectures delivered by him in 1845 and 1846 on the literature all cultural history of the Jews, and his lectures on the Book of Proverbs, delivered in 1853, were very popular.